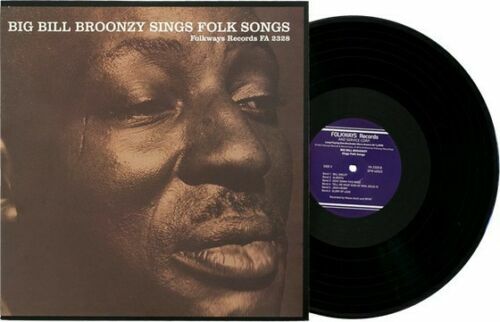 Check out these new and used Big Bill Broonzy vinyl records LPs for sale. Big Bill Broonzy was an American blues musician who was one of the pioneers of folk blues. He was born in Mississippi in 1893, but more recent research has put his birthplace in Arkansas. He served in the Army in 1918 and ended up moving to Chicago around 1920. In 1926, he made his recording debut as a guitarist to various African-American blues artists. Bill later became a singer as well, and by 1940 he was considered one of the most popular blues musicians later touring Europe in the early 1950s. There are many albums by Bill in existence, and we recommend starting with Big Bill Broonzy Sings Folk Songs from 1956 and On Tour in Britain, 1952: Live in England and Scotland. Bill’s life was cut short in 1958 when he lost his battle with lung cancer at the height of his popularity. Our inventory is constantly changing, so check back often, or browse our list of vinyl from blues musicians.